TranSPORT 2017: At-Home Production Has Arrived. Now What? Whether you call it at-home, home-run, REMI, mic’ers, or — as the Europeans do – remote production, one fact is clear: the concept of using facilities and crew at your broadcast center to aid in production of live sports shows in the field is skyrocketing. As the number of at-home productions rises exponentially, demand for reliable connectivity and tools for data transfer between the remote production and the fixed facility back home is exploding. 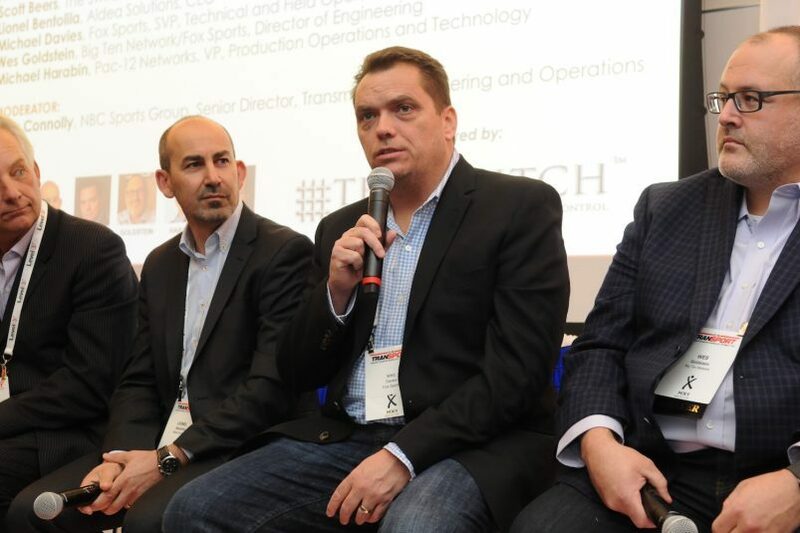 A panel at SVG’s TranSPORT conference in New York last week addressed the at-home–production phenomenon, with leaders from Big Ten Network, Fox Sports, Pac-12 Networks, NBC Sports/Olympics, Aldea Solutions, and The Switch. Much of the discussion — led by Chris Connolly, senior director, transmission engineering and operations, NBC Sports Group — focused on the risk vs. reward of deploying the at-home production model. Fox Sports’ Mike Davies (center) speaks as (from left) The Switch’s Scott Beers, Aldea Solutions’ Lionel Bentolila, and Big Ten Network’s Wes Goldstein look on. “The risk/reward discussion is interesting,” said Pac 12 Networks VP of Production Operations and Technology Michael Harabin. “[Some have said] these are very risky productions and things are going to go wrong. But we just counted up the single points of failure and determined that there were far more possible things that could go wrong on a regular production than on a remote production, where we have our best engineers in-house, multiple pieces of equipment to back up. We just found it to be much more secure — including the transmission — than a regular production. Big Ten Network and Pac-12 Networks have largely led the way when it comes to at-home production: BTN launched its first at-home shows in 2009, Pac-12 immediately after its launch in 2012. This year, BTN and Pac-12 will produce 600 events (including 12 football games) and 415 events (including three football games), respectively, using the at-home model. At-home production has allowed BTN to significantly increase the number of events it is able to produce overall, growing its slate of live productions from 400 when the network launched in 2007 to 600+ events. On the Pac-12 Networks side, Harabin was quick to note that, although many of these at-home productions are lower-profile sports, they are still provided rather sizable production complements, including five cameras, two channels of EVS replay, and 16 channels of audio for 5.1 surround sound. Both BTN and Pac-12 have the benefit of dedicated IP networks (built on Internet2) connecting their broadcast center (BTN in Chicago, Pac-12 in San Francisco) with all the college campuses and venues in their respective conferences. This offers an invaluable advantage over other sports broadcasters (Fox Sports SVP, Technical and Field Operations, Mike Davies joked, “We call it cheating.”), which must coordinate connectivity to the broadcast center for every single at-home production. Fox Sports produces a number of events using its home-run (its term) production model, from lower-profile events on its FS1 and FS2 cable channels to onsite studio shows at larger events to digital needs on massive shows like U.S. Open golf, where it used BTN’s Chicago facility (Fox owns 51% of BTN) to produce all its live-streaming content (Featured Group, Featured Holes, etc.). In those experiences, Fox is quickly learning that deploying consistent facilities across these productions is integral to success. BTN has gone as far as building and deploying its own at-home mobile units, a fleet that has grown to seven, in order to keep its at-home production as consistent as possible across the board. Although major stadiums and arenas usually boast the fiber connectivity necessary for at-home production, major colleges, golf courses, and racetracks do not. Establishing the necessary connectivity for at-home production at such venues requires plenty of coordination with vendors and network carriers. The Switch has been a major player in the growth of the at-home business in recent years, providing broadcasters with connectivity from both major venues and connectivity-deficient venues like NASCAR and PGA TOUR stops. The Switch continues to put an emphasis on the at-home–production market and recently launched its Cumulus cloud-based at-home–production service, which will be based at a new Burbank, CA, operations center. On the panel, Beers said he believes this shared-services model will be vital to the future of the at-home model and the live-sport-production business in general. Establishing reliable connectivity for an at-home production becomes that much more complicated for international events, in which the pipe to the broadcast center must run through multiple countries. Not only do major carriers vary from country to country — along with the price of bandwidth — increased latency also becomes a major hurdle. However, as technology grows and at-home workflows continue to become more sophisticated, Aldea is seeing some broadcasters produce large international events exclusively from home with zero crew onsite. In September, TV Globo opted not to travel any crew to New York for US Open tennis; instead, the Brazilian broadcaster worked with Aldea to bring back several feeds and produce the show entirely from home.